Replacing the rollerhead bearings in the small DeWalt Radial Arm Saws isn't difficult at all. This is the process that I used. First, to remove the rollerhead from the yoke back out the king bolt set screw. The king bolt can then be unscrewed from the locking arm and removed. 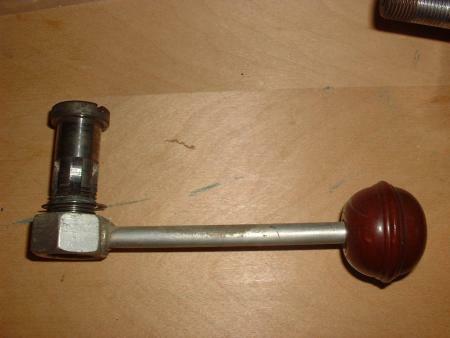 Here is the king bolt assembly. When you reinstall it, the set screw should engage in one of the milled recesses in the king bolt. 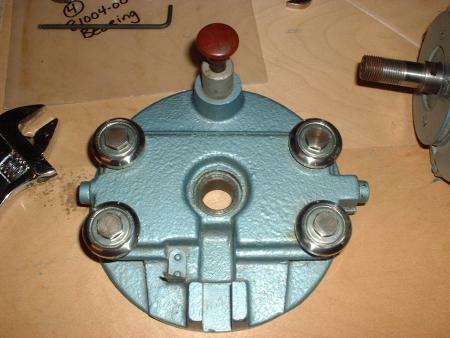 With the rollerhead pulled, you can access the nuts on the bearing studs. The studs nearest the locking pin are straight, those opposite are eccentric. The eccentric studs are used to take up the play between the bearings within the ways in the arm. Here the straight studs have been pulled and the bearings pressed off. Here the new bearings have been installed on the studs. 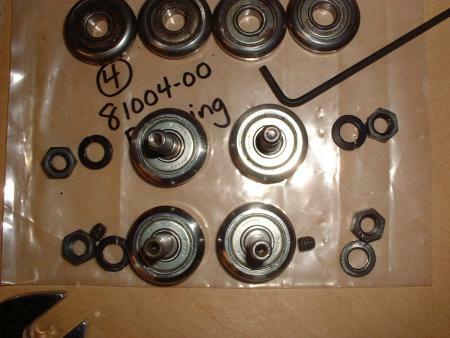 The Original Saw Company sent Nachi 81004 bearings to replace the original Fafnir 200KDD15. The fixed studs are at the top, with eccentric studs at bottom. Note the hex-heads on the ends of the eccentric studs. 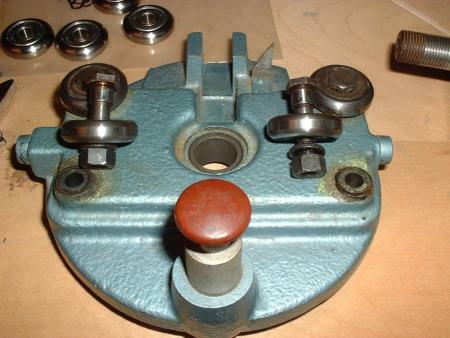 The studs can then be reinstalled on the rollerhead. The straight studs should be fully tightened down at this point, but leave the eccentric studs loose enough to allow them to rotate. 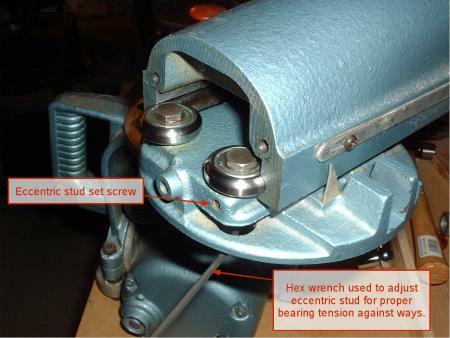 To adjust the rollerhead bearings, use a hex wrench in the end of each of the eccentric studs to rotate the stud. You want a snug fit, but not too tight. 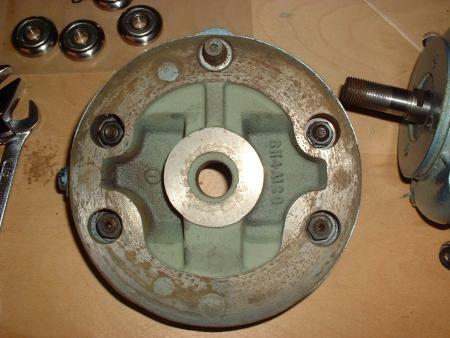 The bearings should all rotate freely along the ways. Once the proper tension is achieved, lock down the stud set screws then remove the rollerhead and tighten the studs. After that, replace the rollerhead back on the yoke. A (very) small amount of oil or wax may be added between the rollerhead and yoke to keep that action working smoothly. 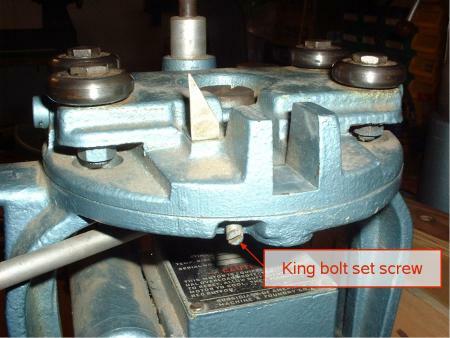 Reinstall the king bolt assembly, ensuring that the set screw engages into the king bolt (as noted above) to prevent the king bolt from backing out during use. With everything installed back in the arm, the action on the arm should now be smooth and quiet.